Firstly, thank you, everyone, for going to the trouble of measuring your wrists for my poll! I’m a little surprised by the results- 74% of us have wrist measurements within an inch of each other. Huh! The poll is a great help in making the pattern, which will be ready in a couple of days. Just a little drying and math and some photos and it’s good to go. Before then, I thought I’d write a little about steeks and cutting and choosing yarn for a project like this. 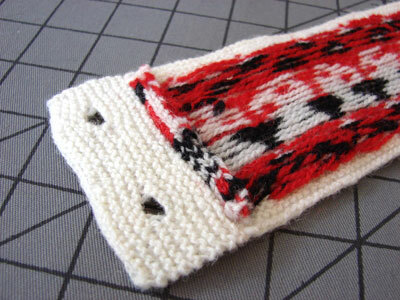 These pulse warmers are a GREAT first steeked project, but you want to get a few things right. I used what’s known as a “sticky” yarn for this. Shetland yarns are perfect, as is the Lamullgarn I chose to use. Harrisville makes Shetland yarn, as does Jamiesons, and Jamieson and Smith. You can see the fuzzy hairs sticking out of the yarn in the photo above. 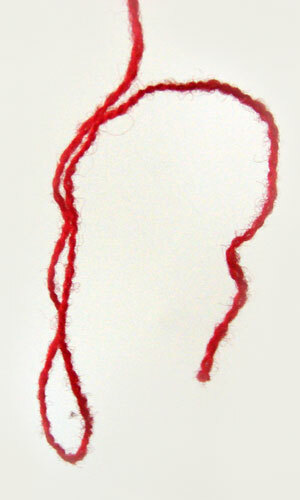 You can also see how the yarn sticks to itself as soon as it touches. This is ideal. If you use yarn like this, you won’t need to reinforce the steek at all, just cut it and pick up stitches, which is what I did. The steek stitches just curl under a bit and stay together very well, because that yarn is so sticky. If you like, whip stitch that little rolled edge to neaten it. You could also whip stitch a strip of ribbon over the cut edge. That would be lovely. If you want to use yarn left over from another project (great idea, since these don’t take much at all) or use a smoother wool like Knit Picks Palette (great idea, because, hey, CHEAP!) you should probably reinforce the cut edge somehow. those are so cute! I’ve never steeked, but am intrigued…. How convenient for me that you have this gorgeous and fun pattern coming out and my new LYS happens to sell Jamieson’s and their grand opening SALE is tomorrow! I think that this pattern would be a great first steeking project! If shetland yarn is stickier than bubblegum, what is the fiber like? Those wee balls we bought last year at Rhinebeck are Shetland! Does the stickiness factor make them more difficult to spin? Yes, Eunny’s tutorials are amazing – but this project is totally a match for her. These are adorable! 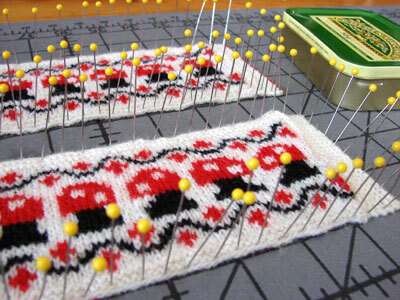 Here’s a random question while we all wait for the pattern….what kind of blocking board is that you’re using and where might one procure such a useful item? I have a self-healing mat that I use for cutting fabric, but it doesn’t look like the same thing. That is some pin action with the blocking! So many pulse warmers. Yay for gnomes! I was curious to know if you own a copy of Gnomes by Rien Poortvliet. If not, you should definitely check it out. It’s beautiful!